The music rounds have made a welcome return to the game, albeit in a slightly different form: This time Rayman is part of a four-piece band and you must perform the on-screen commands in harmony to play Rabbid covers of popular songs. Personally, I feel this is a good laugh, and much better than the dancing game from last year. Shooting rounds are back as well, but this time they consists of Rabbids running around actual cities: It's cleverly done, and quite amusing to see- if somewhat a little slow paced. Once you have completed each mini-game in the Trip mode you can access them again at any time in Free Play mode. You can also mix 'n' match these to make a custom trip- negating the random selection of mini-games. You can also unlock costumes for your Rabbids by completing them: these include Ninja Turtles, Naruto, Spiderman, Sam Fisher, Hippies, Snake charmers... you just name it! 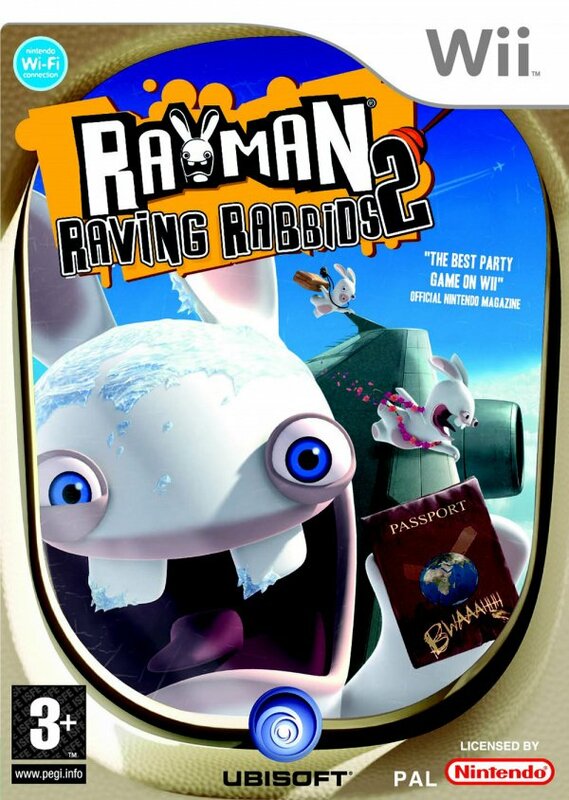 Visually speaking; Rayman Raving Rabbids 2 flows a lot better than its predecessor. The animations seem to be more refined, and the effort gone into superimposing the Rabbids into real life footage (for the cutscene's, and shooting games) is fantastic. The noises are as wacky as ever, with several thousand 'BWAAAAAAAAAAH's' barraging you whilst you play. Its all high quality stuff. But the greatness of the game only lies in its multiplayer mode: There simply is nothing worthwhile in playing this one alone. I strongly advise against purchasing this if you do not like getting the mates round for a bit of crazy Wii action. You would do a lot better playing the first Raving Rabbids game if you just wanted the single player experience. first one to comment after a year and a half! I have the DS one, it is pretty good, but needs more minigames, still I would give it a 7.8/10.